Gangjeon village is located on the southern shore of Jeju Island in the republic of South Korea and is surrounded by ancient sacred sites such as a praying tree, a well and coastal rock formations. Guriumbi is a 1.2 km coastal stretch of porous Andesite and Tachtylite rock coast, now largely occupied by Navy Base development. Although the complete site is known to have been used for prayer and ritual throughout the generations, particularly for the ceremony to pray to the ocean for abundance. At the South East tip of Guriumbi, besides the Navy Base construction there is demarcated shrine that has been used for annual municipal ceremonies throughout the ages. The area is now a focus of an international protest campaign to protect the village and its culture from the navy base. - Hong Sunyoung: Researcher and expert on the Tamnaguk Ipchun Gutnori festival, Posyon, Jeju Island. Gureombi is critically endangered through the construction of a Navy Base at the borders of the sacred site. Many other sites around Gangjeon village will be under pressure from changing lifestyles in the village in case the Navy Base will be finished. Although the ceremonies at the sacred site of Gureombi are traditionally held in annual cycles, this had not happened for several years due to the construction work of the Navy Base. The Navy Base also intersects part of the coastal UNESCO Man and Biosphere Reserve and one of the worlds’ larges soft coral gardens including endangered corals, crabs, frogs and shrimps as well as the Indo-Pacific bottlenose dolphin (Tursiops aduncus) (Ellis et al 2012). For thousands of years, dances form a large part of traditional religious ceremonies in Korea are practiced by Korean men and women of all ages for several days and nights in ceremony known as, Gut (pronounced 'goot'). Types of Gut differ according to the occasion for which they are intended, but the main types are praying for domestic happiness, assisting the passage of the spirits of the dead to the other world, and to pray for the prosperity of the local community. With modernization many manifestations of the Gut have been lost and shamans systematically marginalized by the government, branding them as superstitious and ignorant. It is the shaman to direct the progress of the ceremony at the dedicated sacred site by means of song and dance. The shamans leading the ceremony become a shaman through the Shin Gut which is a 15 day-long grand shamanistic ritual. Many other people from the village also take part in the Gut and have specific roles of cleaning and preparing the site, providing music and doing offerings. Sacred places such as the shrine at Moetpuri are linked to the environment around Gangjeon village. That form an intrinsic part of the socio-cultural life of the villagers and the shaman who look after these special places. With the naval base threatening the village the sacred natural sites that are used to maintain relationships with the peoples ancestors are also under threat. The primary concern of most of the villagers is that the naval Base be stopped and removed and village resorted to its former peace so that culture and nature can once again flourish. "Yowangmaji is the welcoming ceremony for Yowang the Dragon King who is believed to control the sea. As a sub-ceremony in the Yowangmaji, Yowangjilchim is a ceremony to make the way for Yowang and or all deceased who died in the sea, and who died while they protected Gangjeong village. After having them sit on the ritual place, the Shimbang shaman prays to them for the well being of the villagers and for saving Gangjeong. - Hong Sunyoung: Researcher and expert on the Tamnaguk Ipchun Gutnori festival, Posyon, Jeju Islan. Local people have joined hands with many national and international supporters into a movement against the Navy Base in Gangjeon village called “Safe Jeju Now”. The protection of sacred natural sites however is kept in the hands of local guardians, concerned villagers and shamans. Custodians and the action committee have joined hands for a larger cause, which is the preservation of the Gangjeon Village through opposing the the Navy Base. Support regarding the revitalisation and continuation of the ceremonial aspects is also secured through the Keungut Preservation Committee and several research institutes and universities. The “Safe Jeju Now” Action Committee is constantly struggling against the construction of the Navy Base orchestrated by big business, the Korean and US governments. In order to strengthen the spiritual well-being of the Gangjeon villagers a fire ceremony to save Gangjeon village called the Sallim gut was held on the 5th of September 2012, at the shrine of Moetpuri. In September 2012, a group of international custodians, shamans and spiritual leaders visiting the IUCN World Conservation Congress also performed ceremony at Guriumbi and other sacred natural sites surrounding Gangjeon village. The sacred natural sites around the village from a social and spiritual perspective form an important part of the communal life in the village and its struggle for its very existence. The sacred natural sites surrounding Gangjeon village are known to the villagers and shaman that use them for prayer and ceremony but many are not officially registered. 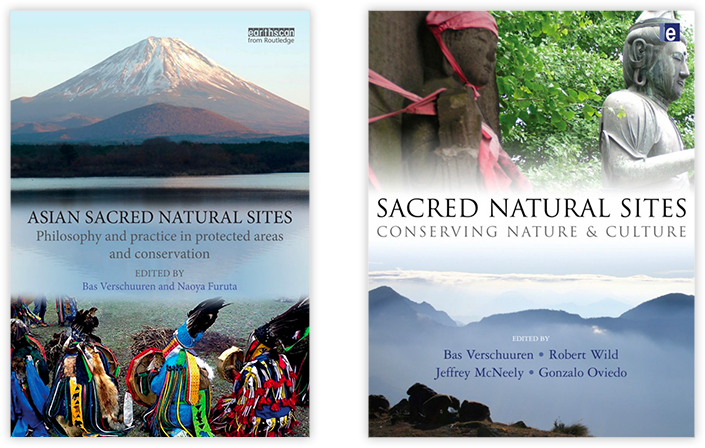 Some of the sites are known to be less frequently visited by the younger generations and there is a general perception of a growing need to secure the roles of sacred natural sites in communal life. The sacred natural site such as the sacred tree and the sacred spring are associated local taboos and rule making regarding the preservation and use of natural resources. Several government agencies are involved with the administration of cultural and therefore some sacred sites For example the National Research Institute of Cultural Heritage under the Cultural Heritage Administration (CHA). CHA however support Navy Base construction while the excavations of bronze age relics in some parts of the site were still on-going despite repeated appeals from Gangjeon village. Under international agreement part of the marine environment adjacent and at certain points intersecting with the Navy Base development has been recognised as UNESCO Man and Biosphere Reserve. The sacred natural sites around Gangjeon Village make an important spiritual and communal contribution to the struggle of saving Gangjeon village from the Navy Base construction. They have generated support from the cultural and environmental movement at Jeju Island as well as from the mainland Korea and various other countries. Through these cultural and environmental movements the struggle for Gangjeon village and its sacred natural sites is receiving increased attention from international peers such as UNESCO and the UNHCR.